Desiel was my best friend ever. He got sick about a year ago with blatter cancer. He was doing ok and vey active until about a week before his death. The vet said that he could live a normal life span and never acknowledged even 2 days before he died that he was near death. His back legs got real weak and he would act confused a couple of days before he passed. A week before he passed we were playing basketball and playing with his favorite rocks. He went out to use the bathroom and didn't make it back in. I scooped him up and held him tight as he took his last breath in my arms. My constant companion was gone forever. I miss that little boy so much it is hard to go on. He was my golf buddy, my fishing partner and my singing friend. He loved to sing with me. His sweet voice is forever silenced. He always met me with a HELLOOOOOO! I know the pain told in these stories and couldn't keep from crying when I began reading them. It has been 3 months since Desiel passed and the pain is always there. I have several dogs in my life and Desiel was the smartest dog I ever met. I was blessed he spent his 10 years with me. I still miss him so much. I am getting older and it won't be to long til I will see him again. I know he is waiting for me. The pain never goes away. I miss my soul mate so much. I think about him a lot. He is slways in my heart. Time goes on but My love for Desiel will never fade I still hurt when I think of him. He was my baby. 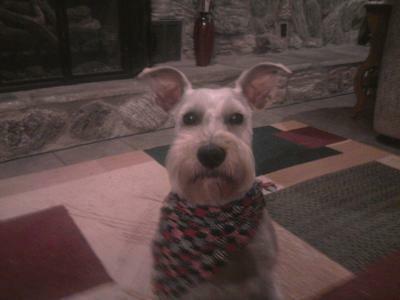 I had a white mini schnauzer named Elvis and he died of bladder cancer too. He was 10 1/2. He started having accidents around the house and then I noticed his pee had blood in it. Then he kept losing weight and couldn't go to the bathroom anymore. I had to put him down in August a day before my 50th birthday it was tough. To top it off our home was burglarized two months after he died. That never would have happened if he was still around. He was a great little watchdog. I'm sorry about your loss I know the feeling. 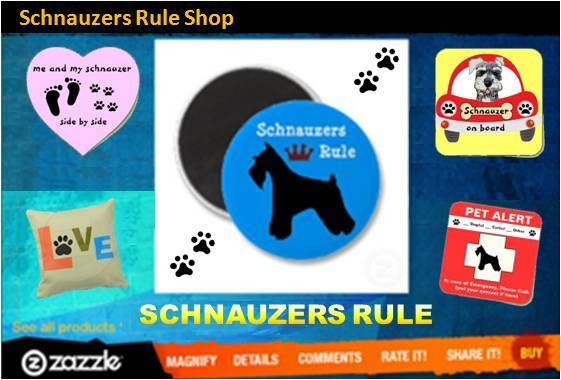 I think pretty soon we will be looking for another schnauzer they are the best! I still feel the pain but have tried to move on by helping other schnauzers who weren't as fortunate as Desiel. I have adopted a little schnauzer from Schnauzer Love Rescue and I am fostering another. Zoey has companions now and is not alone when I leave. Still none have the spark I saw in Desiel. He was my soul mate. The pain is still here and I miss him so much. This was our first vacation without Desiel and it will never be the same. I understand every word you said and also know that dogs grieve too. Going through this with Joey's little sister still. She loved him, too. Joey passed away one year ago today and I've added another tribute today. Thank so much for your kind words and know you are not alone. Desiel was loved. Comfort and peace to you and family. You are all in my thoughts and prayers. I still see him out of the corner of my eye. A flash of white zipping by. I hear his sweet voice in the distance. I imagine seeing him standing in the yard or in his bed. I will never forget those precious memories. So sorry for the loss of your boy. Understand your grief. Diesel was loved and he loved back. In my thoughts and prayers. Zoey is so depressed over her mate she is having a hard time dealing with Desiel's passing. They have been together most of their lives. I am not helping her much cause I am still crying almost daily and Zoey I know she picks up on my emotions. She just lays around and mopes. We are both having a very hard time moving on. I miss his sweet voice so much and his presence in our sad house. He was so much a part of every part of our lives. I am still having a hard time believing he is gone. I'm really sorry. I completely understand the deep sorrow you're having right now, as well as I'm still having mine. You see, I lost my little Luna two months ago due to a longtime kidney problem that finally led her to an uremia. The thing is she only had one kidney to live because she had lost the other one many years ago, but since she lived during nine years with only one kidney (which is a lot of time in a dog), her health inevitably deteriorated so much specially her last five months or so. She was vomiting, lost too much weight and didn't want to eat properly so, sadly, my family decided to put out her pain. However, she incredibly kept her energy at most of her final moments for playing, running, barking and sniffing at other dogs, like desiring to stay forever with us no matter what. I lost my best company a person can have ever, too. I send you a very big hug and hope our little babies are enjoying together with no suffering in Heaven.